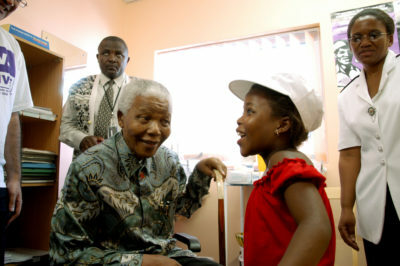 The message behind Mandela Day is that we all have the ability and responsibility to change the world for the better. In theory many people agree with this sentiment, judging from the 2.8K likes that a Nelson Mandela quote like “our society needs to re-establish a culture of caring” can garner on the Nelson Mandela Foundation Facebook page. However, the question asked regularly around Mandela Day, is why do we need to have a special day to remind and motivate us to do something kind and meaningful to improve our society? And once we have been moved to action, why are we only doing it for a day? I, personally, have struggled with this question: in the face of the hardship of children and adults that I see daily, everywhere I turn in South Africa, why am I not doing more in my personal capacity to change this? According to neuroscience, we are hardwired for empathy. There are specific exceptions, for example in the case of psychopaths, but in general most of us have the ability to feel for another person, to imagine ourselves in the same situation, enduring the same experiences and emotions. This ability comes courtesy of “mirror neurons”, which activates my brain in exactly the areas that are activated in your brain. For example, when you reach out and touch an object, a certain area of your brain becomes active, and if I watch you do this, the very same area in my brain becomes active even though I am not physically doing anything. Combining phantom limb studies with those on mirror neurons, we see that the reason that people don’t ‘actually’ experience the feelings/sensations of another person is because systems in one’s own body, like the receptors in our skin, quickly send back messages to our brain, letting us know that we aren’t actually doing anything and so we can relax – our experience is thus moderated. As humans we are therefore ‘wirelessly’ connected to each other and we have a huge capacity to understand one another and to relate to what others are going through. However, there seem to be two major factors that work against us really developing a deep understanding of another person. The one is direct exposure: it is obvious that the less exposure we have to phenomena or to other people’s experiences the less opportunity there is for empathy. Second-hand exposure might compensate slightly: the mirror-neuron effect is more pronounced in face-to-face situations, but there are studies showing that when children watch violent television programs, mirror neurons, as well as several brain regions involved in aggression, are activated. In South Africa where the structure of our society continues to keep us separate, there are sections of the population who never encounter the hardship of others. This situation conveniently serves our psychological tendency to avoid being exposed to the poverty or deprivation of others for the sake of avoiding our own discomfort and personal distress such as feelings of guilt, shame and fear that it could happen to us. The second factor is how our own beliefs, whether they are conscious or unconscious, moderate our ability to empathize by regulating our emotions. Some research shows that if you believe a person is suffering for their own good, you feel less distress – this is illustrated by the example of a mother who watches her baby being stuck with needles for the sake of a vaccination. Along the same lines, if you believe people somehow deserve their misery, that they are lazy or incompetent, or just looking for a handout, your ability to empathize with them drops dramatically. Some of the most chilling atrocities of the Second World War happened because of the erosion of empathy for Jews, largely enabled by the dehumanization of the Jewish people. Similarly, the systematic dehumanization of Black people in South Africa through the institutions and ideology held during Apartheid, eroded many South Africans’ ability to empathize with one another – decades later barely a week goes by that we don’t hear new, disturbing evidence of this. The good news is that given the plasticity of the brain, we can grow our ability to empathize – and with the rapid development of the brain during early childhood, this is a particularly important time to do this. ‘Roots of Empathy’ is a classroom programme implemented in various countries which boasts impressive results in reducing levels of aggression among schoolchildren by raising their emotional competence and increasing empathy. It does this by allowing kids to attentively observe, through the course of the school year, how a baby develops, reacts and interact with his mother and other stimuli. This simple exercise in attentive awareness develops their skills to recognise and investigate emotions, and it makes them more aware of others around them and their emotions. So what can you do on Mandela Day that will make you a more empathetic South African and that will contribute to making this country a better place? Be attentive and aware in your interactions, be fully present, really listen and give those helpful mirror neurons of yours an opportunity to help you to truly connect to another human being. But empathy alone is not enough. We also need to understand what turns empathy into compassion – the strong drive to alleviate suffering, which is followed by real action to do this. In 1973 an interesting experiment was done at the Princeton Theological Seminary. A group of divinity students were told that they were going to give a practice sermon and they were each given a sermon topic. Half of them were given the parable of the Good Samaritan as a topic and the other half were given random Bible topics. Then, one by one, they were told they had to go to another building and give their sermon. As they went from the first building to the second, each of them passed a man who was bent over and moaning. Only 40% of them offered some help to the man. Interestingly, those contemplating the parable of the Good Samaritan were not more likely to help. What determined whether someone would stop and help was how much of a hurry they thought they were in. Psychologist and expert on emotional intelligence, Daniel Goleman, points out that we have a spectrum that goes from complete self-absorption, to noticing, to empathy and to compassion. The more preoccupied and focused on ourselves we are, the less we fully notice the other. “We don’t notice and don’t notice that we don’t notice… and therefore we don’t act” Dr. Goleman points out. So another practical thing that we can do is to simplify and structure our lives in a way that create space and time for us to really notice others and to engage with them. This can have a strong multiplier effect -when one person starts noticing, they tend to draw the attention of more people and so our overall capacity to notice grows. Lastly, and on a more personal note, a significant obstacle that has prevented me from taking action is a feeling of being overwhelmed by the scale of the need in South Africa, feeling intimidated by the huge number of causes to support, and uncertain in terms of what I could do that would be truly helpful and contribute to change. To give you a sense of the dilemma: there are serious subsistence needs in South Africa; a quarter of children under three years of age are stunted, while a multi-country study found that children’s height at two years of age is the best predictor of adult human capital. There are systemic flaws resulting in 30% of 13 years olds remaining illiterate despite attending school. This waste of human potential is a human rights violation costing the country dearly, with the estimated GDP loss as a result of low literacy levels being around R550-billion per year. There is the sad fact that South African children endure shockingly high exposure to violence and abuse, with one in five 15-17 year-olds reporting that in their lifetimes they have experienced some form of sexual abuse, and more than a third of them saying they have been physically hurt by an adult who was supposed to be taking care of them. What can individuals do that would be meaningful and that could even lead to change in the face of such harsh statistics? Nobel Prize-winning economist, James Heckman, illustrated that combined with the fulfillment of basic needs in early childhood, an investment in early stimulation and language development is the most powerful investment in human capital that a country can make. It is an investment with compounding returns like greater equality, better education and health outcomes, a stronger economy, and a better society with less crime, public violence and greater social cohesion. With each year adding about a million babies, and with no formal early childhood development system currently in place, in the short term government alone will not be able to significantly reduce the tragic loss of human potential that will hamper our progress and quality of life for decades to come. Early childhood tends to be a ‘make or break’ time for life potential given the critical brain development that is taking place during pregnancy and the first five years of life. Thus, the greatest possibility to create real change rests with us as ordinary South Africans. Create opportunities for other people to also get involved. Can we do all this only for a day? Thankfully for us, Nelson Mandela dedicated more than a day of his life towards bringing real change to South Africa. Real change is highly dependent on the relationships that we create and our continued engagement in them. The definition of relationship excludes the possibility of a once-off encounter. Yes, there are helpful gestures that we can make on a celebratory day like Nelson Mandela Day. However, the most important thing that we can do is to use it as an opportunity to make a real start. I’m also looking for funds to buy resources for our communities. I am so happy and proud that I have come across a website such as this one. It puts me at ease to realise that there is someone out there who also believes that changing the world depends on each and every individual and not just waiting for the government to create change. I personally strongly believe that I can change the world for the better. I have a huge project that the Lord Jesus Christ placed upon my shoulders. I have a passion for touching and building lives. I love helping people. I am going to apply for funding….. I have a lot of projects I wish to run and I strongly believe they will bring change to personalities or individuals and eventually the world at large.